Rainy days can be great for us to snuggle up and watch a movie, but what about your dog? We’ve compiled plenty of ideas to keep your rowdy pup entertained during those cold, rainy days! Remember in elementary school when we used to call our friends to hang out and play games together when we were bored? Well now you can return to those good old days by doing the same for your pup! Invite one of their neighborhood furry friends over to play fetch, wrestle, or just blow off some steam together. Play dates are a great way to socialize your dog. You and their friends’ owners will surely appreciate them burning some energy, too! A timeless game, tug of war is beloved by many dogs. Perfect for playing indoors, this game is sure to keep you and your dog entertained. You can purchase a tug of war rope or just use an old rope or t shirt. Just make sure it’s tough enough that it can handle your dog’s strong pulls! Hide and go sniff is the perfect game for your dog to get some mental stimulation and exercise while indoors. You hide treats around the house and your dog will sniff around until they can find them! When rainy weather lasts for a few days, this game is important for training their noses when they can’t get time outdoors to adventure. Kongs are sure to keep your dog busy and satisfy their hunger. The toy has only a small opening to access their treat of choice, so your furry friend will have to work to get their reward! Kongs are another great way t0 keep your dog’s mind sharp when they might not be able to get as much time outdoors. If you and your dog are feeling bored, try teaching them a new trick! Handshaking, rolling over, and “speaking” are fun party tricks that you can work on with your dog. Check out some Youtube videos for step-by-step instructions on teaching your dog new tricks. Encourage them with treats and positive feedback. Your dog will love spending time with you and will appreciate your approval! 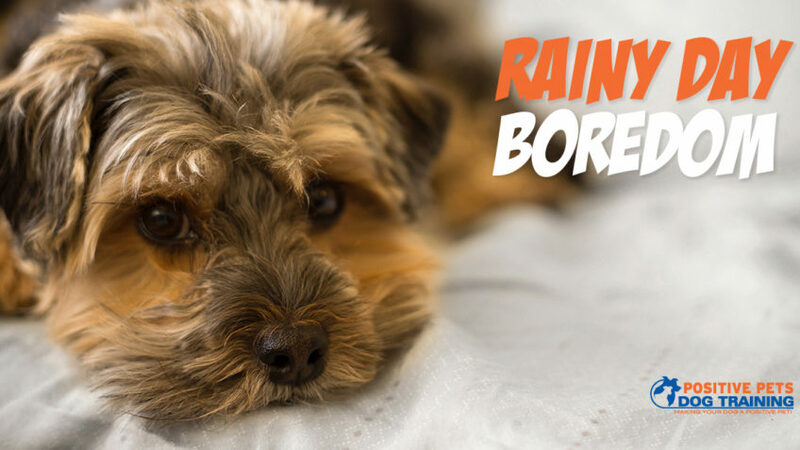 Rainy days don’t have to be boring for you or your dog! Try some of these fun activities and enjoy the indoors!